Bistro du Vin Clerkenwell recently opened in London and will be the first of several restaurants to open up as part of the Hotel du Vin chain. The restaurant is welcoming, with a warm bistro-y feel. The décor is rustic and charming, with chalky grey and bluish tones. The walls are dotted with wine memorabilia, the fireplaces and corner pieces are stacked with decorative bottles and there is a strong use of wood throughout the restaurant. The intention is to provide a neighbourhood retreat, and Bistro du Vin has done this well. Diners have the option of eating at the pewter-topped bar (the longest dining bar in London) that circles the restaurant’s open kitchen, or to dine al fresco under during the warmer summer months. And of course, there is the option of eating at one of the many tables inside the cozy retreat. We dined as guests of the restaurant and started with a Chase marmalade vodka martini (£10), a specialty of the house, which was damn good. 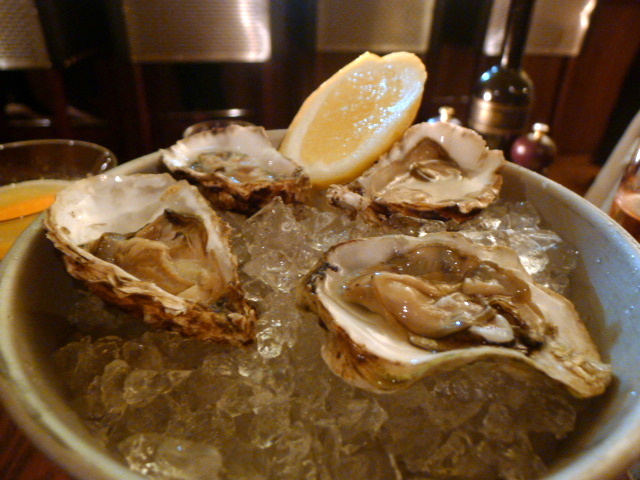 This was followed by a some of the oysters on offer – fine de Claires (£3.50) and Cornish (£2.50) which were both delicious and fresh. But it was the former which won my heart with its robust meatiness. 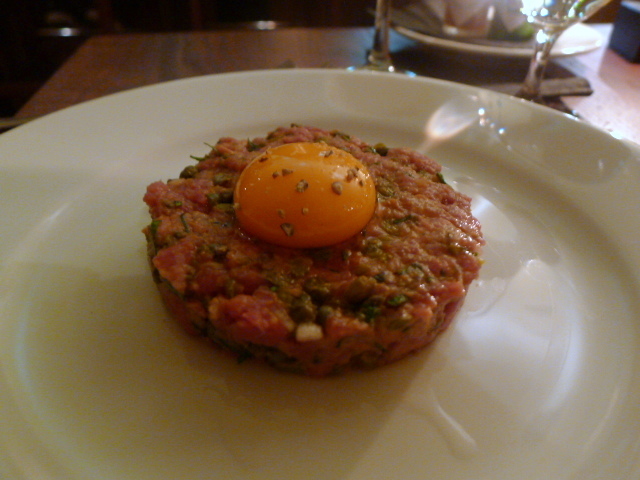 A steak tartare (£7.50) contained a nice balance of acidity to cut through the richness of the flavoursome and well seasoned meat. 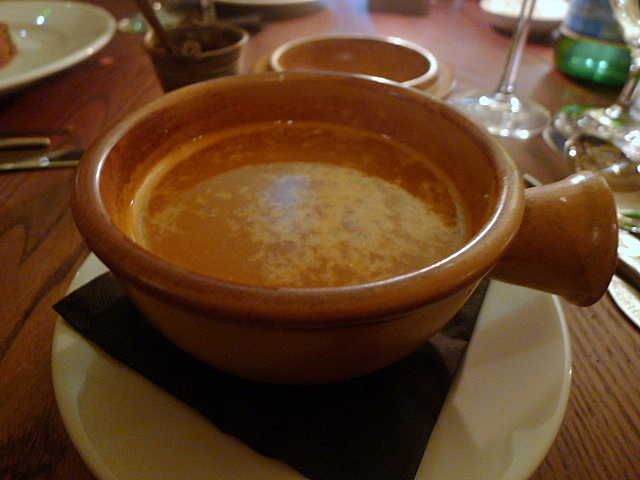 A second starter of lobster bisque (£5.95) was reasonably tasty, but its consistency was a little on the thin side. Further reduction was needed to produce a more concentrated flavour. A sharing platter of hot roasted shells (£55) contained a half lobster, crayfish, razor clams, king scallops, oyster, crabs and mussels. 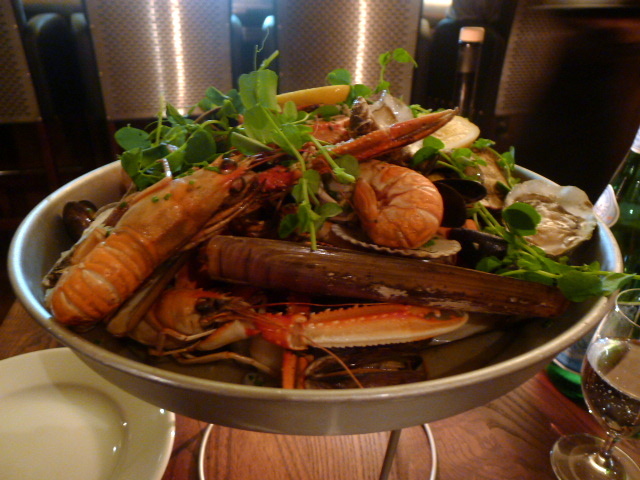 The platter was impressive to look at and generously filled, and the seafood was undoubtedly fresh. Most pleasing of all was the crab for its sweet, sweet flavour. But we needed help from the restaurant to break into it as the crab was cut into two rather than four pieces, which, with our clumsy natures made the flesh difficult to access. I also thought the quality of the razor clams to be impressive for they were also wonderfully sweet. But they had not been cleaned properly, and we found grit in the shells. To accompany the platter was some wonderfully thin and super crispy pommes frites (£3.50) which were well seasoned. These were extremely well done. A chevre, mache peas and mint salad (£5.95) was pleasant, spring-y and nicely dressed. The melted chevre cheese on toast was particularly appetising in a melted cheese sort of way. A side serving of peas with spring onions (£3.50) was very well cooked with a hint of crunch, but a little peppery. 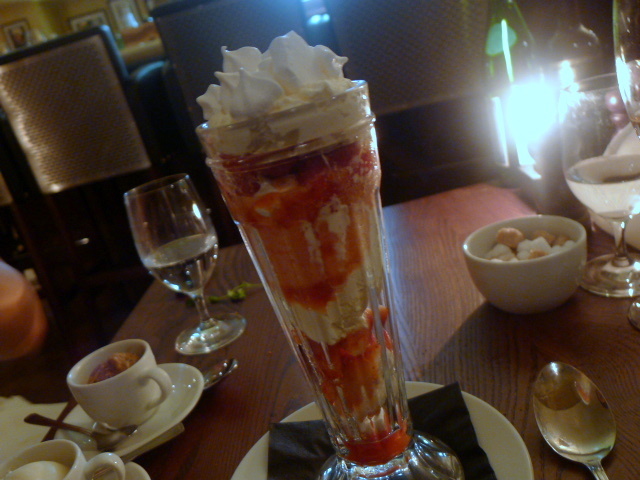 To finish, a strawberry vacherin sundae (£6.95) was impressive. A lovely combination of sweet strawberries and strawberry purée, crunchy meringue and Chantilly cream, this was one of those comforting desserts that one always finds satisfying. 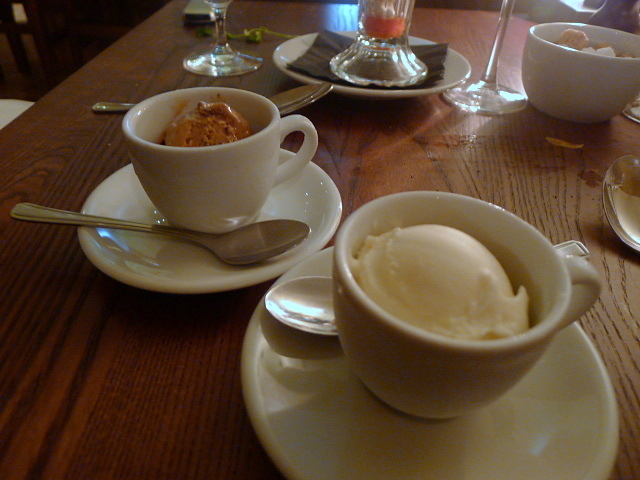 We tried a scoop of each of the dulce de leche and cornflake ice creams (£2.50 per scoop). The dulce de leche flavour tasted harsh on the palate and did not work. Its sweetness wasn’t quite right and there was an astringent quality to it. But the former was creamy and cornflake-y (also serving this on the menus right now is the Hawksmoor Seven Dials). Overall the service was resoundingly sweet, but there were a few areas where it could have been better. The restaurant didn’t wipe our table after the big mess we made with our platter (we are clumsy after all), and our hand bowl was replaced with water so hot it scalded my hand. Our seafood platter wasn’t without hiccups. There was no excusing the grit in our razor clams. But that said, there’s no doubting the freshness of the seafood and there were other aspects of our meal which I enjoyed. On balance, with its attractive appeal, it would be difficult to discount Bistro du Vin in the seductive neighbourhood bistro stakes. Price range: £23 – £44 for three courses. Excludes drinks and service. I really enjoyed my meal there as well. Next time try the Josper steak. I second GC on the Josper grilled steaks – gorgeous! Hard to go past them once you see the meat ageing in the case at the front! Bummer. GC and GD, I should have tried the Josper steak. Next time!